Speggen (3-2) defeated LeeS (2-3) but he's sitting at 10-7. Distractions aside, it's time to get to work. After Thursday, the dust of the challenge settled and the results were clear: I went 3-2 and LeeS went 2-3. Actually 2-4 if you count his lock for the Sabres to take the Phillies, a series I respectfully bowed out of. Sure, I bested him and I should be doing a victory lap around Presque Isle since—OK, doubt I could make it a quarter of the way around—LeeS now has to pony up and buy Sibley a beer. You're welcome, Sib. But you won't find fanfare coming from my house. No. None. No banner. No belt. No championship ring. Nothing. After all, I really went 2-3 this week—my first losing week. And I'm only three weeks in. Yeah, it's safe to say, I'm rattled now. I called the Indians over the Royals (a challenge LeeS issued). Cleveland brought their brooms last week as they swept the Royals. Wait, does that mean I can count all three games? My stats would be a bit shinier if I could. Sure, I picked the Indians based on family loyalty, but Cleveland fans, you have to be happy: the Tribe's looking good so far this year. I planned to head to another buck night at the Uht, so I called the SeaWolves since it worked for me last time. LeeS took Reading—not the leisurely activities with written words but the team, well maybe he read some; I don't know since we didn't maybe that. Anyway, Mother Nature told the Wolves to take a day off. She poured. And poured. And poured. So Erie played a doubleheader Tuesday and took both games. Can I claim them both? Even better stats if I could. Here's where things fall apart and my center not only couldn't hold—he didn't even take the field—yes, both sports and literature in the same sentence. Let me say, 'you're welcome,' to all of five people who might get that as I properly readjust my glasses on my nose. No distractions. Back to my debacle. I made a risky move and thought some NFL teams might do the same. Just a few years back everyone thought Reggie Bush would come off the board first. He didn't. Even more recent, people thought Brady Quinn would be an early name in the draft. He wasn't. So I thought the trend might hold: teams might eschew taking Cam Newton. Players like Newton have the reputation of being a homerun or a strikeout—nothing in between, and I thought this might affect the Panthers' decision. It didn't. And LeeS took a W for this one. Then came the biggest collapse. The Pens and the Explosion. For the second straight week, I told you I had faith in the Pens. I liked their tenacity and their mental toughness. Then came Saturday. Tampa Bay blew them out—second worst loss in playoffs. But I thought they could recover. All they had to do was win one game. One game. Apparently they just didn't have it in them this year, which was evident in game seven when they looked exhausted. No other word. Beat. Then I raved about the Explosion, even sent you to their website to get yelled at. Told you I wanted to be able to claim I was there first. Well, sometimes charging headfirst into battle just ain't the smartest thing—especially when you have to use that noggin for locking down some sweet maybes. So even though this might have looked like a cupcake pick, it wasn't. Turns out, sometimes you find a rotten egg when you're baking even the easiest recipe. So yes, the Explosion lost by one point to the basement-dwelling Stampede. But am I going to jump ship? Absolutely not. I got cracked eggshell on me, but the Explosion had only one bad game, and that happens to even the best, right? After all, I had a losing record this week—technically. OK, so I'm sitting at 10-7, which is dangerously close to .500 and I can't have that. No. If I dip below .500, I'll give myself one week to pull it out of the gutters, but if I'm sitting below .500 two weeks in a row, I'll respectfully bow out and pass off the maybes to someone else a little better at picking games that might kind of maybe almost be good decisions. That's a tall order, and I'm a short guy, but darn it, I expect better of myself. Monday Night Baseball. Sure, it lacks the flare—and viewership—that Monday Night Football brings, but it's got a nice ring to it anyway. Then again so does Monday Morning Maybes. So the Yanks take on the Tigers in Detroit. It's a pretty solid match up, but I give the edge to the pinstripes. The Tigers got bested by the Indians on Sunday on the road while Yanks are coming off a win at home against the Blue Jays. I'm riding the momentum train, so I'll say that the Yanks, even though they're in the visitor's dugout, take the W at the end of the night. So somehow I ended up picking them last week but for intentions not directly related to sports. OK, I picked them for family. Bottom line. I've got some great in-laws. One problem though: they're Cleveland fans, and although I originally lived about an hour away from the city, I root for Pixburgh. It took us awhile before sports season became tolerable, but we're at the point we can be in the same room and not draw blood. Pretty good, right? Well, here I am to extend the hand and cross the aisle: I'm picking Cleveland of my own volition and because I think they're winners. See they just took down the Tigers and are on a roll. They head out west to take on the A's Tuesday. Normally I'd say the home team has an advantage, but Oakland's got a game Monday and the Indians get some rest while they travel. 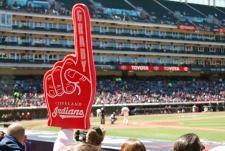 And to me, that equals a big ol' M, um, W for Cleveland, so take the Indians. And take the olive branch. What the heck is up with the Bolts? They dropped the Pens and just took two games against the Capitals. On Cap's ice. OK, all signs point to me taking Tampa Bay, but I just can't do it. Maybe the pain from the Pens losing to them is blinding me, but Alex Ovechkin isn't mentioned as one of the greats currently playing the game for nothing. Sid the Kid was out with injury, so Ovechkin came in as the league's only stud in the playoffs that even non-hockey fans would recognize. He's one of the league's premier faces—toothless or not—so I look for him to put up a fight. And maybe even shell out some Chiclets in the process. At least in the next game. Sure, the Bolts are 2-0, but Ovechkin forced OT but just couldn't close. Practically everyone picked the Caps to take this series and they did so for good reason. Ovechkin. And now he realizes how much is riding solely on him now, so I look for him to step up big when the Caps take on the Bolts on Tampa ice Tuesday. Yeah, those do get a lot of limelight, but Rose and Bulls quietly put together a great record and a winning method. They even acquired some good players through trade. Then they quietly got through the first round nearly perfect. Sure, Boozer hasn't been stellar in every game, but Rose has. And he does it quietly. The guy's seamless and focused. And when the Hawks come to town Monday night, I look for the Bulls to come out ahead. Trust me, I know the Hawks have talons and the Bulls don't, but man, these bulls are scary good. The wait is over. They're here. It finally took shape. Now they're going to run the table. Sounds familiar, right? It's what most people start proclaiming immediately after the Heatles net a big win. The Celtics old. They just forgot where they are. You can't blame them, really; it happens when guys have all those years behind them and have all that time off. But they've got excellent long-term memory. They know how to win games. They know how to focus. They know how to turn it around. Heck, I'd say this defeat is exactly what they needed. Clear the slate and start anew. The Celtics lost sight of the goal. Pierce got heated—make of that what you will—and got tossed. He won't get tossed again. I look for him to put up big numbers, and I also look for Rondo to turn his game around and take control of the team like he needs to. Celtics will take the next game when the two meet Tuesday in Miami. And then watch for the wheels on the Heatles tour bus to fall off and the pundits to tear them apart. Yankees and Indians on the diamond. Capitals on the ice. Bulls and Celtics on the hardwood. A chunk of maybes chalk full of possibilities.